A woman is being treated in hospital for a serious eye injury after a firework exploded at her feet at the Lewes bonfire celebrations. The woman was with other members of the Seaford Bonfire Society when she was injured last Saturday. Kevin Gordon, who was marching with her, said debris from the firework "shot up and struck her in the eye". About 60,000 people attended the event, with 170 people treated for injuries, 22 of whom were taken to hospital. The firework involved is known as a "drop-down banger". They are thrown to the ground during the event. "Everybody in the bonfire society is quite shocked about this," Mr Gordon said. Patricia Rykiel was with her teenage children and husband when she was also hit above the eye by a small piece of debris from a similar firework. "It did frighten me... and I said 'this is rather dangerous'," she recalled. The number of people injured at the event was 43 more than last year. South East Coast Ambulance Service and St John Ambulance said most were relatively minor injuries. Police said there were a large number of firework injuries in the streets. Plain-clothed Sussex Police officers were in the town for the first time and confiscated a number of fireworks. Officers said it was illegal for people to throw "drop-down bangers" but it was tolerated by the people in the parades. A total of 15 people were arrested, mostly for drunken behaviour, possession of drugs and minor assaults. 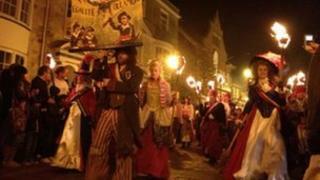 The Seaford Bonfire Society was taking part in the celebrations after being invited by the Commercial Square Bonfire Society, which was one of the six Lewes bonfire societies parading that night.